The brand new Samsung Galaxy S9 and S9+ are out in the world. With the new devices comes some usage confusion along with the obvious excitement. If you are planning on getting yourself the brilliantly designed Galaxy S9 and wondering how to take a screenshot without a real home button, this post is for you. For those who had opted for Samsung’s Galaxy S8 last year, you won’t find the process any different. From Advanced features, you can enable Smart capture, which shows additional information after you take a screenshot on Galaxy S9 or S9+. After taking a screenshot, you will be able to instantly edit or share it. But along with sharing and editing, this toggle also allows you to take a scrolling screenshot. First, enable Smart capture from Settings > Advanced features. Navigate to the screen you want to take a shot of. Keep tapping the “Scroll capture” button to keep going down the page until you are done. The fancy new Samsung Galaxy S9 also enables you to take some fun screenshots in the shape of rectangles and ovals. Enable it from Settings > Display > Edge screen > Edge panels. 5- The easiest of all – Bixby! AI is making things super easy for us. 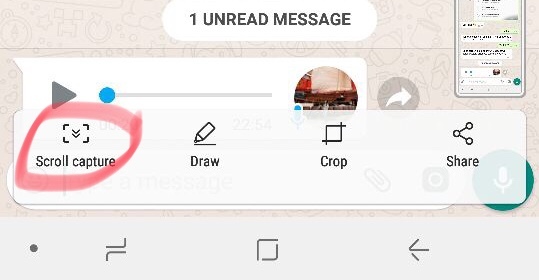 The best and the easiest way to take screenshots on Galaxy S9 and S9+ is to just use your voice. Say Hi, Bixby and activate the smart assistant. Take a screenshot and all will be done for you! When you enable Smart capture (method 3), it could be a little annoying especially if you have to take multiple (non-scrolling) screenshots quickly, as you face an additional pop-up after every single screenshot. You can keep it disabled except for the times you need to take scrolling screenshots. Do note, however, that the Smart Capture also opens doors to a number of other features like cropping or drawing on screenshots, or sharing them with a contact or through another app. Samsung Galaxy S9 isn’t a major release like last year’s Galaxy S8. However, Samsung’s decision to focus on the camera and keep the headphone jack while keeping the price down to $719 will definitely win some new customers and keep its fans happy.